Tightening wood posts in simpson ez bases? 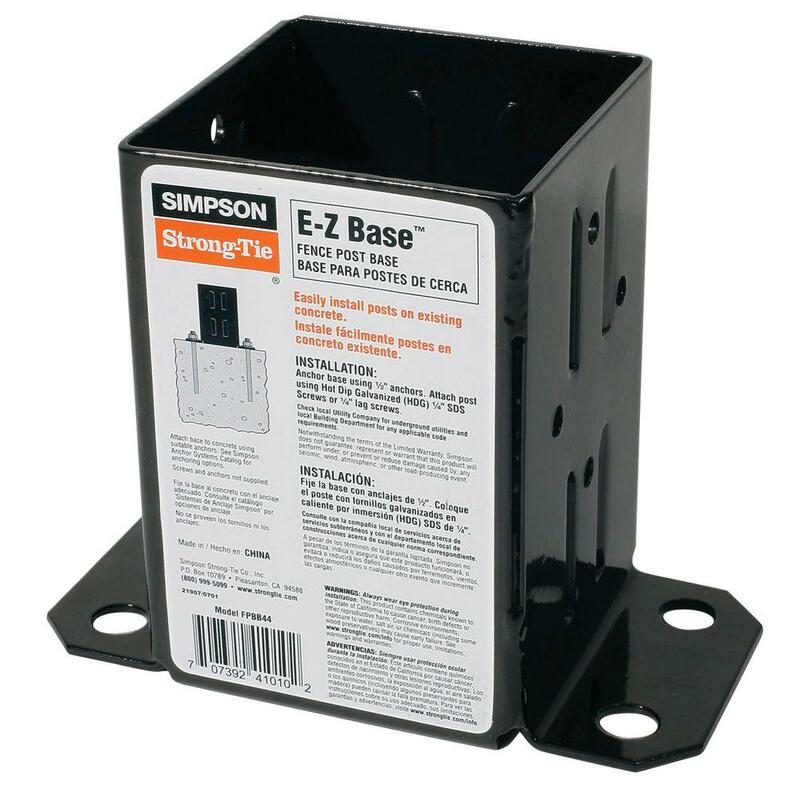 I bought several of these Simpzon ez bases for our roof. Due to the climate here, I need to check and maintain the bases and the wood periodically. For this reason, I shaved of some of the wood so that the wood posts can be easily removed from the base. Some I removed too much wood and move around a bit, but not too much. 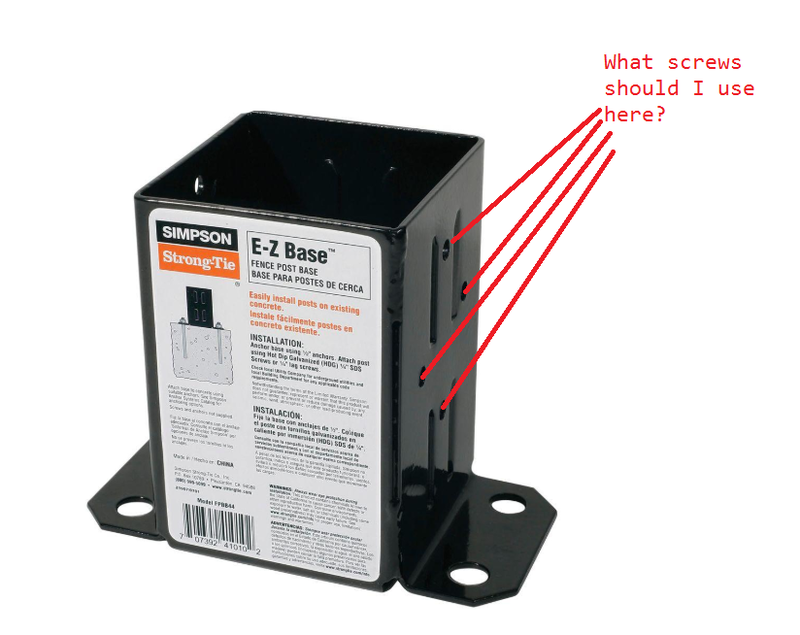 Since I'll be using wood screws to secure the post to the base, what screws can I use to secure the base and stop the wood post from moving inside the base? Simpson Strongtie makes it simple, the only fasteners officially approved for use with the product happen to be the ones they make and sell. Could you use a generic equivalent fastener? It's pointed out in the comments that Simpson only specifies THEIR screws, but a generic galvanized lag screw ought to work fine. I wouldn't lose a minute's sleep over it. I'd bet there's really nothing unusual about Simpson's screws shaft diameter, material, thread depth, corrosion resistance, etc. Depending on the locale, code may require that specialty hardware like this be installed according to the manufacturer's instructions. Some products, like joist hanger nails, Simpson's literature specifies generic equivalents; but I didn't see any for these screws. Another hardware manufacturer, they might not make fasteners and might only specify generic hardware for a similar product. So if you really want to go by the letter of the code, you have to use Simpson's screws. It's not a lot of money and it keeps things simple. I just consider the specialty fasteners part of the cost of the specialty hardware. Not the answer you're looking for? Browse other questions tagged wood roof screws fence or ask your own question. Compacting soil after removing fence posts to install new posts with vibratory ram? Should I add a mound of concrete on top of existing concrete to direct water away from fence posts? Removing 4x4" wood from base? How to build a sturdy forest road gate out of roundwood? How can I support a spinning log for a playground set?